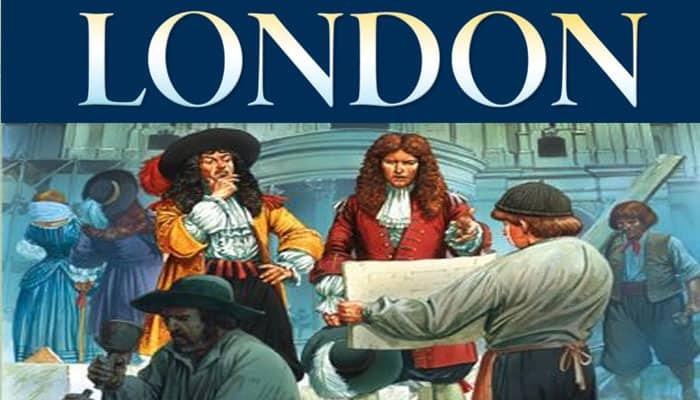 London starts just after the great fire of London and ends with the advent of the 20th century. In the game you will be responsible for running part of the city. You must balance finance with grandeur, with your achievements being measured in victory points. However, you must be careful not to let rising poverty swamp your efforts. London is very much a card game. The cards are divided into three decks to create a sense of historical development. You will create a Building Display, a line of cards laid out in front of your position at the table. The cards in your display will give you various benefits, such as money, victory points, and reduced poverty. The majority of cards will only have an effect when you decide to run your city. Money is important, in that you need it to pay for some cards and to buy land. How much money you make depends on what cards you have on your Building Display when you run your city. If you do not have enough money you can always take a loan. Buying land allows you to gain more cards and reduces the impact of poverty (with more land you reduce overcrowding). The board is divided into areas which are referred to as 'boroughs'. Each borough has a purchase cost, the number of cards you then pick up, and how many victory points you score at the end of the game. Where you buy land can be significant, as the effect of some cards depends on which boroughs you own. Poverty is a big issue. Generally you increase your poverty when you run your city. You can reduce your poverty points through having certain cards on your Building Display. The game will end when the deck has been exhausted. You now count up your victory points. These are gained from the boroughs you have building counters in, the cards played on to your Building Display (including those that have been built over) and money in hand. You will lose victory points if you have any poverty points and/or outstanding loans. 30 black poverty point cubes Each cube represents one poverty point. 10 black poverty point discs Each disc represents five poverty points. One deck of 110 cards The cards are divided into three smaller decks, labelled ' A', 'B', and 'C'. There are 25 cards in the 'A' deck, 50 cards in the 'B' deck, and 35 cards in the 'C' deck. The limited edition version of this game contains wooden buildings that should be used instead of the building counters, and wooden money. Each player selects a set of building counters. Place the money and loan counters by the side of the board to form a bank. Place the poverty cubes and discs by the side of the board to form a pool. Place the Underground and victory point counters by the side of the board. Each player takes £5 from the bank. The small silver coins are worth £1, while the larger gold coins are worth £5. Players must keep the amount of money they have on open display. Each player starts with five poverty points. Each cube represents one poverty point, while each disc represents five poverty points. Separate the cards into three decks, with each deck being made up of cards marked with the same letter. Shuffle each deck. Place the 'C' deck face down by the side of the board first, then place the 'B' deck face down on top of the 'C' deck, and then finally place the 'A' deck face down on top of the deck. Deal out six cards to each player. Determine who will be the first player by placing one building counter from each player face down and picking one at random. 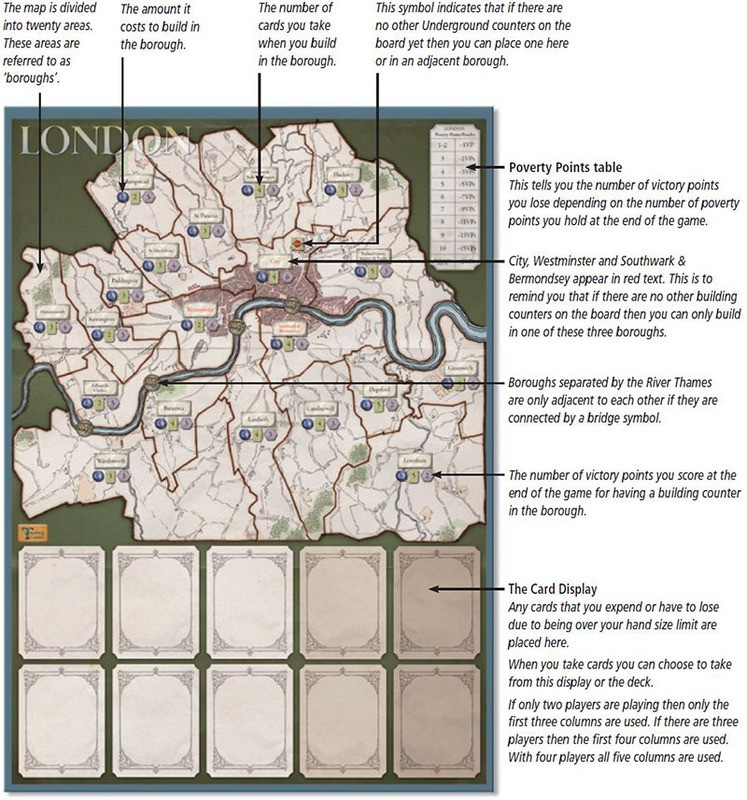 The key to understanding how to play 'London' is to become familiar with how the cards work. All cards have a colored background, which will either be brown, pink, light blue, or grey. Brown cards are related to economic activities, pink cards are related to political activities, and light blue cards are related to science and culture. Grey cards are Paupers (essentially useless unless you can educate them or find menial work for them). B Any text here will describe a power that comes into effect as soon as the card is placed on to your Building Display. You may utilize this power without having to activate the card. The power will remain in effect while the card can be clearly seen, i.e. if you build on top of the card you will lose the use of the power on it. 1 The cost to play the card. 2 The value in the hexagon indicates the number of victory points that you score for having the card on your Building Display at the end of the game. Note that all cards on your display, including ones that have been flipped and/or built over, will still score the points marked on them. 3 Important: Only cards with this stone base image can be played on to your Building Display. 4 Each card will be marked 'A', 'B', or 'C'. At the start of the game you must make sure the cards are separated into decks of the same letter. 5 The left-hand block tells you whether you need to pay money or expend a card to activate this card. Expend a card of any color. Amount of money to be paid to the bank. 6 The middle block shows the effect of the card if activated. The amount of money you take from the bank. The number of victory points you take. Discard one poverty point for each such symbol shown on the card. 7 The right-hand block tells you what to do with the card after it has been activated. Flip the card on to its other side. If this symbol does not appear then the card remains face up. Starting with the first player, play proceeds clockwise around the table. Players take it in turns to take one card and then perform one action. Once a player has done this, then play proceeds to the next player. Play continues in this way until the end of the game. When it is your turn you start by taking one card into your hand (this is not optional). You can either take a card from the Card Display or the top card from the deck. You can exceed the hand size limit (which is nine cards) when you do this. Whenever you take a card you can take it from either the deck or the Card Display. If you have to take more than one card then you can choose to take from both sources in any combination you wish. If you take a card from the deck you can look at it before deciding where to take the next card from. After performing one action you must check your hand to see if you have more than nine cards. If you do then you must reduce your hand to nine cards. The cards that you remove from your hand must be placed on to the Card Display. You are not allowed to simply pass and do nothing. During the course of the game you may find yourself requiring more money than you have in hand. When you require additional cash, you can take a loan. Each individual loan gives you £10. You can take as many loans as you require at the point in time when you need more money. If you are required to give money to another player and you do not have enough to hand then you must take a loan. You cannot repay loans until the end of the game, when you pay £15 for each outstanding loan. You may play as many cards as you like from your hand down on to your Building Display. You must play at least one card. The Building Display is a notional area in front of your position at the table. 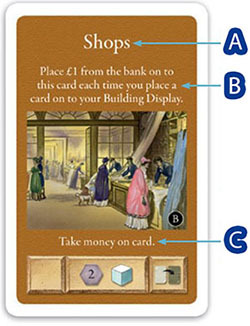 To play a card on to your Building Display you must expend one card of the same color from your hand. The card you expend must be placed on the Card Display. You can only play cards on to your Building Display that have a stone base image at the bottom. When you play a card on to your Building Display you can either place it on top of another card or on its own (forming a new stack). If you place it on top of another card then the card you are placing on top of can be face up or face down. You cannot place a card on top of a card that you have placed in the same turn. All of the cards on your Building Display should be arranged in a line. The order of cards in the line is not important. Note that there is no way to reduce the number of stacks on your display. Some cards require you to pay an amount of money to place them on your display. This amount is in addition to the card you have to expend to play the card. You can have duplicate cards on your Building Display. The Huguenots, Jewish Immigrants, and Wren cards do not require you to expend a card to be able to use their ability. Each of these cards must be placed on the discard pile rather than the Card Display if their ability is utilised. As these cards do not have a stone base they cannot be played on to your Building Display. You can still use these cards for their color rather than the power on them. Pauper cards cannot be placed on to your Building Display. If the card has a permanent power (which will be described towards the top of the card) then as soon as it is placed on to your display you can utilise that power. Please note that cards in your hand are of no use until you select the Play Cards action, i.e. they cannot be played at any other time. When you expend a card you must always, if possible, place it on the top row of the Card Display. If the top row is full then you place it on the bottom row. All cards must be kept face up. Only one card can be placed in a space. If both rows are full and you need to expend a card then you remove and discard all of the cards from the top row. Now move all of the cards on the bottom row up to the top row. You can now continue to place cards on the Card Display. The discarded cards should be placed in a discard pile next to the deck of cards. They will not be used in the game again. If there are two players then only three spaces on each row are in use. If there are three players then only four spaces on each row are in use. If there are four players then all of the spaces are in use. After taking a card from the deck the active player has the hand shown here. He then plays his Huguenots card. He draws two cards. This does not require the expenditure of a card. He draws another two cards from the deck. The Huguenot card is placed on the discard pile. He plays the cards here on to his Building Display. The Coffee House card does not require the expenditure of a card. 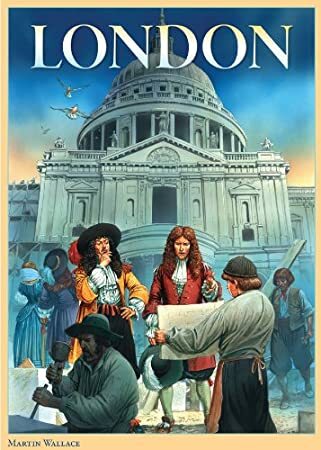 He must pay £10 to the bank to play down St. Paul's and £4 to play the East India Company. As he does not have that amount of money he has to take a loan. 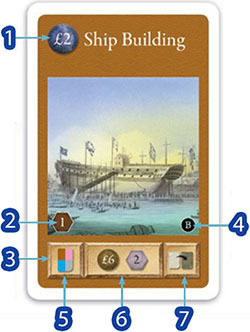 The player has to expend cards on to the Card Display to play the other cards on to his Building Display. He expends the cards shown here. He is left with one card in hand, and his turn is over. When you run your city, you can activate some or all of the cards on your Building Display. You decide whether you wish to activate each particular card. You also choose the order in which you wish to activate your cards. You must activate at least one card. The stone base of each card on your display is divided into three blocks. A symbol in the left-hand block indicates whether you need to expend a card from your hand or pay money to activate it. Any symbols in the middle block indicate the effect of the card when it is activated. A symbol in the right-hand block indicates whether or not you need to flip the card over after activation. Example: This card would require you to expend one card from your hand to activate it. You would then earn £7. The card should then be flipped over. If you do have to expend a card then it must be placed on to the Card Display. If a card allows you to discard poverty points then you can never have fewer than zero poverty points. You cannot 'save' any unused discards. Finally, if a card has a 'flip' symbol on it and you activated it then you must flip it over. Once cards are flipped over they cannot be used again. Once you have finished activating cards you must calculate your change in poverty points. You add up the number of stacks you have on your Building Display (a stack being one or more cards in a pile, either face up or face down). You now add to this total the number of cards you have in your hand. You then subtract from this total the number of boroughs you occupy on the board. You take a number of poverty points equal to your final total. The final total can be a negative one, which means that you discard that number of poverty cubes. The red player decides to run his city. His Building Display is as shown above. He expends one card to activate the East India Company. He takes £12 from the bank. He then pays £7 to take five victory points using the Woolwich Arsenal card. Next, he takes the Almshouses card from the Card Display and places it on top of his Coffee House card. This card can be activated immediately, which he does, allowing him to discard two poverty points. The British Museum gives him another victory point and allows him to discard another poverty point. He must flip those cards that he activated that have the 'flip' symbol on them. He chooses to 'flip' the Hospital card instead of the East India Company card (which is the special ability of the Hospital card). He now calculates how many poverty points he must take. He has five stacks of cards on his Building Display and one card in hand, which will give him six poverty points. However, he occupies one borough, which reduces the number of poverty points he takes to five. If you activate an Underground card then you must place two Underground counters on the map. Each counter must be placed in a separate borough. Each borough can only have one Underground counter placed in it during the game. You can only place an Underground counter in a borough which contains a building counter (although it does not have to belong to you). The first time anybody has to place an Underground counter they must do so in the City borough or an adjacent borough. After that you must place the Underground counter in a borough which is adjacent to a borough containing another Underground counter, i.e. all Underground counters must be placed in a contiguous group. However, the two counters you place do not have to be adjacent to each other. If the Underground counter you place adjacent to is on the other side of the River Thames then you must pay an extra £3 to the bank. You can only place across the Thames where a bridge symbol is present. 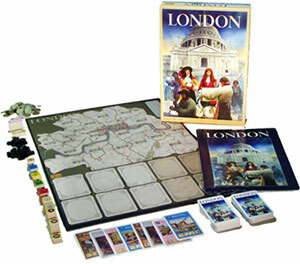 At the end of the game a borough containing an Underground counter will score an extra two victory points for the player who has a building counter there. In the example above the playing of four Underground counters can be seen. The yellow player has been the first to activate an Underground card. The first Underground counter had to be played in or adjacent to the City. Yellow places in Southwark& Bermondsey. He then places the second counter in Deptford. He would not be able to place it in Bethnal Green,Stepney & Poplar as the borough is not adjacent to Southwark & Bermondsey. The red player is the next to activate an Underground card. He places the first one in the City, as it is adjacent to Southwark. He must pay £3 to the bank as he has had to cross the river. He can only place the second counter in Westminster or Bethnal Green, as these are the only two boroughs that contain building counters. He decides to place it in Westminster. (Please note that this is not an example of good play!). The map is divided into areas, which are referred to as boroughs. As an action you can take one of your building counters and place it in one unoccupied borough. There can only ever be one building counter in a borough. You can only place one building counter in a turn. 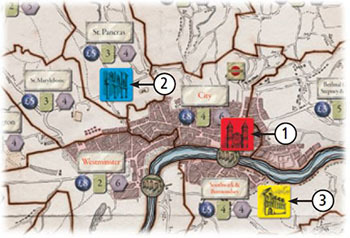 The very first time that this action is chosen the active player must choose between the City, Southwark & Bermondsey, or Westminster. Once there is at least one building counter on the map, in subsequent actions you can build in any borough which is adjacent to a borough that contains a building counter. The color of the counter is not important, it can belong to any player. The River Thames forms a barrier between boroughs. If there is a bridge symbol between two boroughs, then they are regarded as being adjacent to each other. If there is no bridge symbol, then the two boroughs are not considered to be adjacent to each other. You must pay an amount of money to the bank, as indicated in the borough, to place your building counter there. You must immediately take a number of cards as indicated in the borough. The red player is the first to buy land in the game. He is restricted to buying in the City, Southwark & Bermondsey, or Westminster. He decides to buy land in the City. He pays £8 and takes four cards into his hand. The blue player is the next to buy land. He is able to buy in St. Pancras as this borough is adjacent to one already containing a building counter (the City). Later on yellow decides to buy land in Southwark & Bermondsey. He can do so as this borough is adjacent to the City, as it is connected by a bridge symbol. You take three cards. If there are not three cards available to be taken then you take however many cards are left. It may be the case that you cannot take any cards, in which case you can still select this action but in effect do nothing. The game is close to ending when the deck of cards has been exhausted. After the last card has been taken from the deck (not the Card Display) and the active player has finished his turn then the remaining players have one more turn each. You must still take a card at the start of your turn if possible. Once the remaining players have had their turns the game ends. You now calculate how many victory points you have gained. First you must pay off as many loans as possible. To repay a loan you must pay £15 to the bank. You then take one poverty point for each card you have left in your hand. You then discard your remaining cards. Take one victory point for each lot of £3 you have. 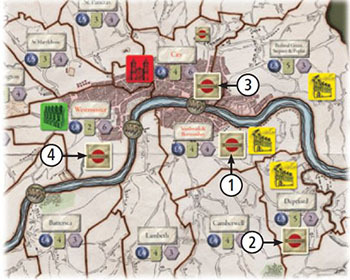 Each borough that you have a building counter in scores a number of victory points as indicated on the board. Add two victory points to this value if there is an Underground counter in the borough. Each card in your Building Display, irrespective of whether the card has been flipped or built on top of, scores a number of victory points as indicated on the card. Each unpaid loan of £10 loses you seven victory points. The player with the fewest poverty points discards all of his poverty points (which may be zero). The remaining players discard the same number of poverty points. You then consult the Poverty Points table on the board to see how many victory points you lose. You lose points according to the number of poverty points you have in hand. If there is a tie, then the tied player who has the fewest poverty points is the winner. If there is still a tie, then the tied player who occupies the most boroughs on the map is the winner. If the tie is still not broken, then the tied player who has the single highest value victory point card is the winner.